The wins have been hard to come by, but the lessons have been frequent – including another painful one on Saturday night. Once again, the shorthanded Cavaliers fought valiantly for 48 minutes. 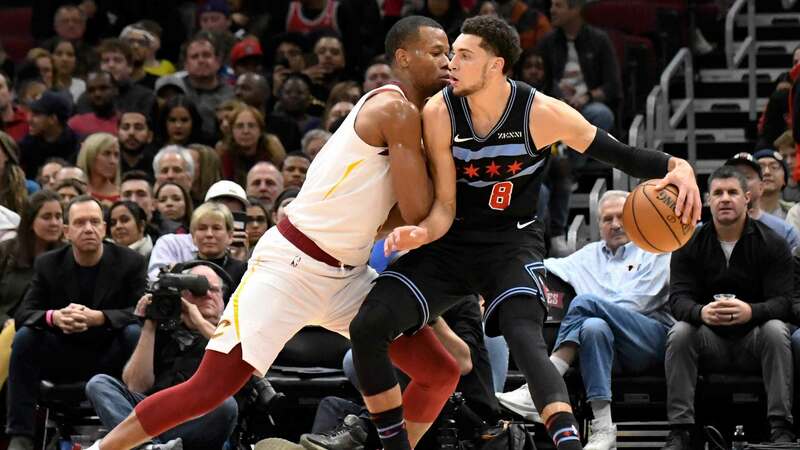 And once again, they were stung in the closing seconds – as the Bulls rebuffed Collin Sexton’s potential game-winner at the buzzer, sealing the 99-98 win in the Windy City. 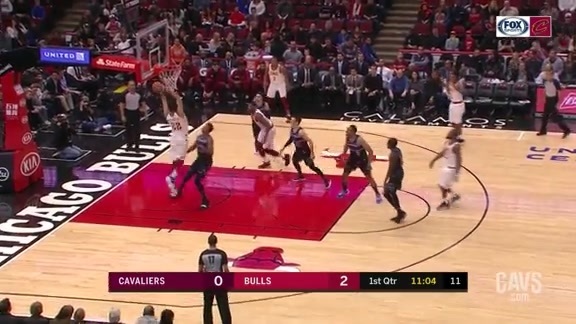 The Cavaliers and Bulls – each missing several key players – went toe-to-toe for four quarters, with Cleveland cutting Chicago’s late five-point lead to just one on Rodney Hood’s thunderous dunk with just over a minute to play. 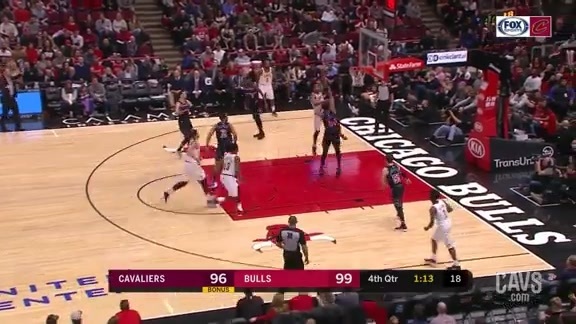 With 13 seconds to play and the Bulls up a point, Tristan Thompson picked Zach LaVine and the Cavaliers immediately called timeout. 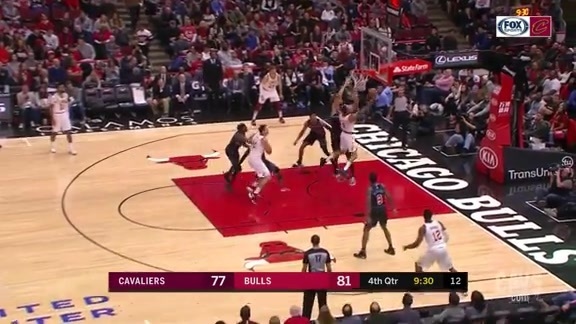 On Cleveland’s last possession, Sexton – making just his second career start – dribbled left through the lane around Ryan Arcidiacono and tried to finish at the rim with his right hand. The attempt rattled out, but Sexton got his own rebound. He put up another attempt at the bucket, but Jabari Parker swatted the offering the preserve the victory for Chicago and sent Cleveland to its fifth straight loss. 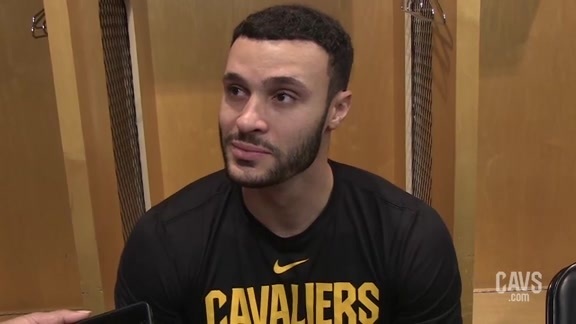 The Wine & Gold were without regular starters Kevin Love, Sam Dekker, George Hill and Cedi Osman. But they’d get no sympathy from the Bulls, who were missing Lauri Markkanen, Bobby Portis, Denzel Valentine and Kris Dunn. With the Cavaliers depleted along their frontline, Coach Larry Drew decided to start Larry Drew alongside Tristan Thompson, and the move paid off handsomely – with the duo combining for 26 of Cleveland’s 53 rebounds. On the night, the Wine & Gold dominated on the boards, grabbing 53 rebounds to 38 for Chicago – including a 15-5 advantage on the offensive end. Offensively, Nance didn’t have his best game, going just 1-of-8 from the floor on the night. But the former Wyoming standout excelled on the glass, grabbing a game-high 14 rebounds to go with a career-best four blocks. Balanced scoring attack not enough for the Wine & Gold in Chi-Town. 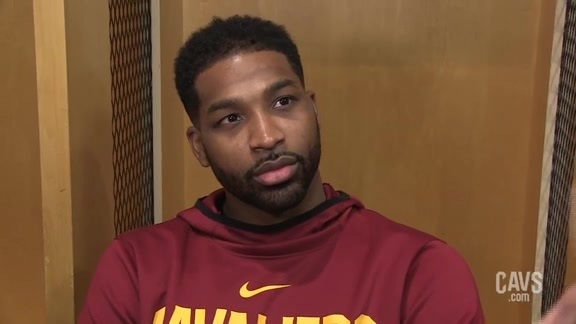 Tristan Thompson has been outstanding for a while now and he posted another double-double on Saturday night – finishing with a team-high 22 points on 10-for-14 shooting, adding 12 rebounds (seven of those off the offensive glass) and a pair of steals. Sexton, who led Cleveland with 15 points in his first career start on Wednesday night at The Q, was even better against Chicago – netting 20 points on 8-for-16 shooting, including 2-of-3 from long-range, to go with four boards and three assists. Rodney Hood had his best outing since a 26-point effort in the Cavaliers’ lone victory of the season – netting nine of his 20 points in the fourth quarter against Chicago, going 4-of-8 from the floor in the period and 7-for-15 from the floor overall. Jordan Clarkson did what he does best – put points on the board – notching his 12th straight double-figure scoring performance to start the season, finishing with 15 points on 6-of-16 shooting in 25 minutes off the bench. The Bulls were led by Zach LaVine, who’s now topped the 20-point plateau in every game this season – pacing both squads with 24 points, going 9-for-22 from the floor to go with eight boards, five assists and a pair of steals. Turning Point -- In a game that featured seven ties and eight lead-changes, there wasn’t much of a turning point. But there was a moment when the game could’ve gotten away from the Cavaliers before they clawed back to make it a contest. 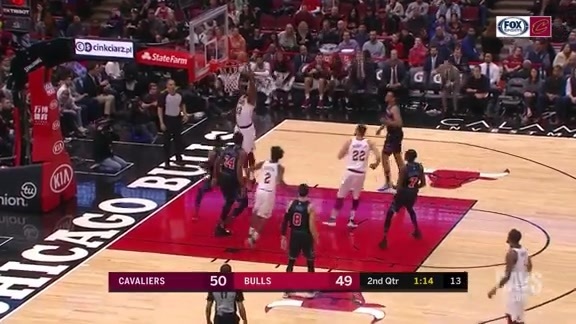 The Bulls jumped on Cleveland early, taking a two-touchdown lead into the second quarter and made it 16 on Antonio Blakeney’s runner less than a minute into the period. 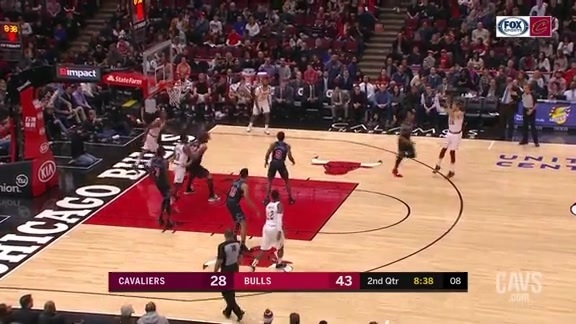 Chicago kept the Cavaliers at a double-digit distance for half the period, but Cleveland came on strong before intermission – with Tristan Thompson and Kyle Korver keying a 25-6 run that saw the Wine & Gold take the lead on Sexton’s turnaround jumper with 1:34 to play in the half. The Bulls and Cavs would eventually head to the locker room knotted up at 53-apiece, setting up the late-game histrionics that eventually went the Windy City’s way. By the Numbers – 17.0, 14.3, .615 … Tristan Thompson’s scoring and rebounding averages as well as his shooting percentage (24-of-39) over his last three outings – posting a double-double in each of those games. Up Next -- After dropping a nail-biter the Bulls on Saturday night, the Wine & Gold return home for the first half of a midweek back-to-back, welcoming Kemba Walker and the Hornets to The Q on Tuesday night before hitting the road the following evening for a date with John Wall and the Wizards on Wednesday. Following the back-to-back, Cleveland gets a nice four-day break before traveling to Motown for a Monday night meeting with the Pistons – a warmup for the arrival of LeBron James and the Lakers two nights later. Cavaliers center Tristan Thompson spoke with the media following Saturday's loss to the Chicago Bulls at the United Center. 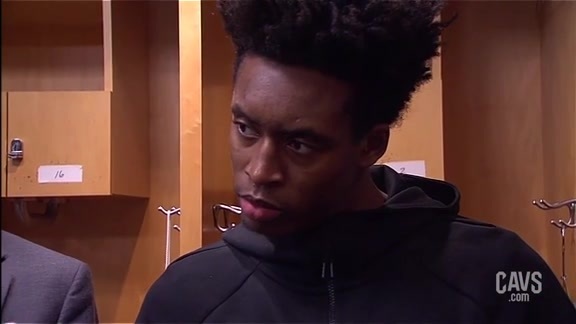 Cavaliers guard Collin Sexton spoke with the media following Saturday's loss to the Chicago Bulls at the United Center. 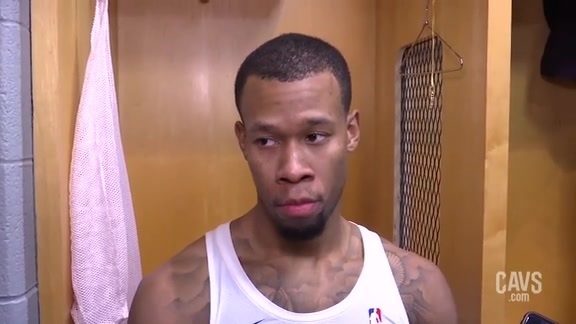 Cavaliers guard Rodney Hood spoke with the media following Saturday's loss to the Chicago Bulls at the United Center. 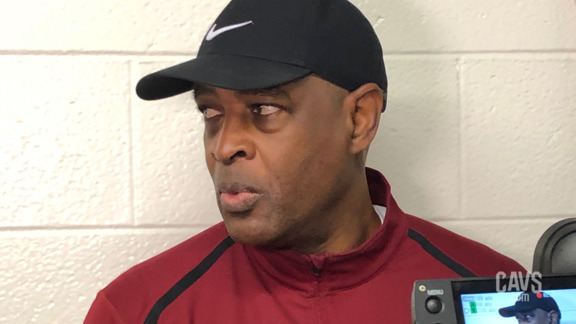 Cavaliers Head Coach Larry Drew spoke with the media following Saturday's loss to the Chicago Bulls at the United Center. 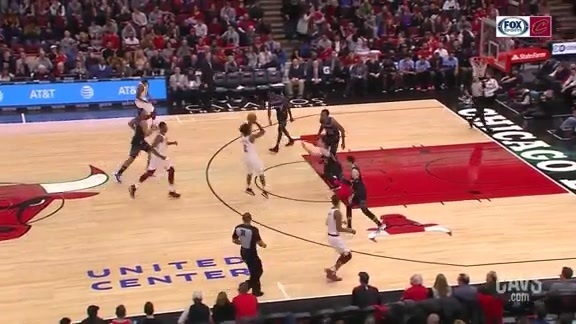 Rodney Hood flies high and puts the Bulls on a poster. Tristan Thompson crashes the offensive glass and throws home the putback slam. Jordan Clarkson takes it strong to the bucket and finishes the tough layup. Collin Sexton cans the pull-up jumper in transition. Collin Sexton alertly grabs the rebound and snaps it to Tristan Thompson for the easy slam in this ‘More Driven Highlight’ driven by Goodyear. 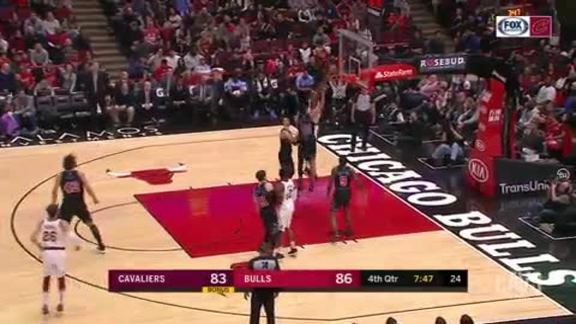 Kyle Korver and Jordan Clarkson help trim the Bulls lead with back-to-back triples. 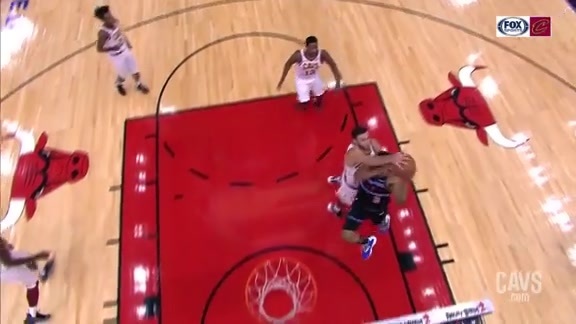 Larry Nance Jr. takes down the Bulls and comes up with the chase down rejection. JR Smith drops the pocket pass to Larry Nance Jr. for the flush. 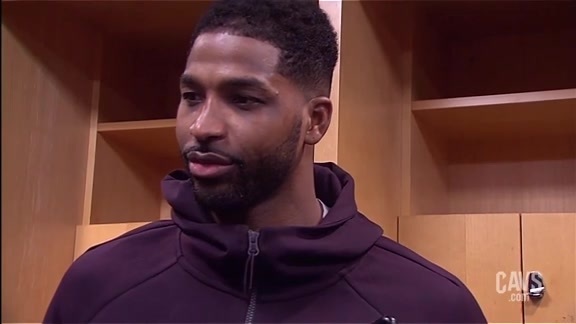 Cavaliers forward/center Tristan Thompson spoke with the media prior to Saturday's shootaround at the United Center as the Wine & Gold prep for the Chicago Bulls. 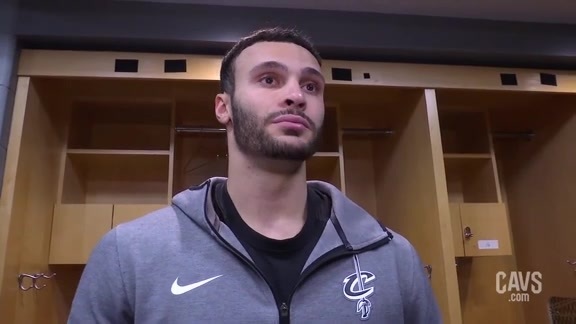 #CavsBulls Shootaround: Larry Nance Jr.
Cavaliers forward/center Larry Nance Jr. spoke with the media prior to Saturday's shootaround at the United Center as the Wine & Gold prep for the Chicago Bulls. Is Coach Drew Going Big or Small Lineup? 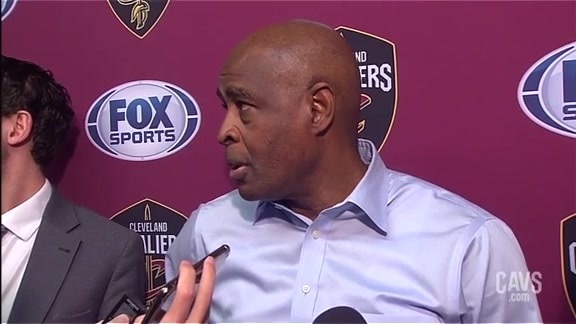 Cavaliers Head Coach Larry Drew spoke with the media prior to Saturday's shootaround at the United Center as the Wine & Gold prep for the Chicago Bulls. 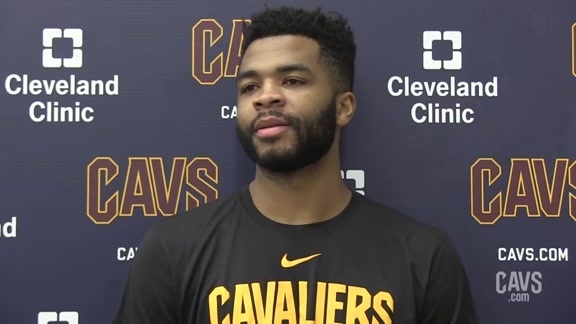 Cavaliers guard Andrew Harrison spoke with the media following Friday's practice at Cleveland Clinic Courts as the Wine & Gold prep for the Chicago Bulls. 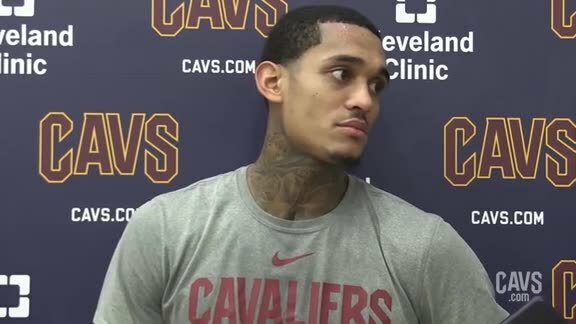 Cavaliers guard Jordan Clarkson spoke with the media following Friday's practice at Cleveland Clinic Courts as the Wine & Gold prep for the Chicago Bulls. 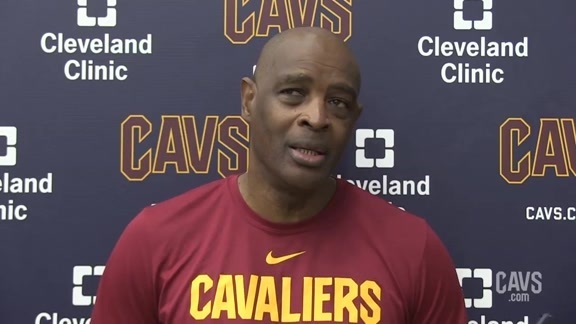 Cavaliers Head Coach Larry Drew spoke with the media following Friday's practice at Cleveland Clinic Courts as the Wine & Gold prep for the Chicago Bulls.